Members of the Hillsboro boys and girls varsity Cross Country team pose for a group photo at Harmony Lake in Hillsboro. Hillsboro’s boys and girls varsity Cross Country teams are looking to rebuild the programs in 2018. Ladies Head Coach Olivia Fulton knows that her team has to be able to build on the go in 2018 while also keeping girls on the course. “This year the biggest change will be re-building our program in the past two years we have struggled to have a full team run and keep girls healthy for an entire season,” said Fulton. Both teams have returning runners that they will rely on to lead the rest of the team in 2018. “Molly McCreary, ran last year for the first time. She was awarded all-league last year and was competitive at districts. This year with some experience, I expect her to continue to grow as a runner,” Fulton said. “Bailey Lucarello is our lone senior returning to the team and will serve as one of our captains. He has the ability and drive to make some things happen in our league and hopefully in the post-season,” Schneider told The Times-Gazette. Fulton would like to be able to keep her runners healthy this season and see what they can do with a full contingent at each meet. “With the injuries we have faced in the previous years, running a full team at all meets. Allowing for us to be competitive not only to ourselves but also all teams racing,” Fulton told The Times-Gazette. For the boys Schneider knows they are young but believes their experience in middle school will help. “We are young but most of our kids have competed in cross country at the middle school level,” said Schneider. The girls of Hillsboro have set individual goals for the season that Fulton is in agreement with. “We have established individual goals as runners and will as a team strive to stay healthy and compete as a team for each meet,” Fulton said. Both coaches ended with a message to the community for the 2018 season. “Cross Country isn’t the most spectator friendly sport, however that does not take away how hard my runners work at practice. Without complaint they run high milage each week, complete various workouts for strength and support each other as a team. Not only my runners but all the Hillsboro runners deserve support for the upcoming session and during our home race September 1st, the Ohio Classic. Their hard work should be rewarded,” said Fulton. “Our home meet, The Ohio Classic will take place on Saturday, September 1. It is a middle school and high school event. We can always use volunteers and extra help. Get in touch with me or our athletic office if you are interested,” Schneider said. September 1 – The Indians will host the Ohio Cross Country Classic at Liberty Park in Hillsboro. September 18 – Hillsboro will travel to Leesburg to participate in the 2018 Highland County Cross Country Meet. Both the boys and the girls have runners that are capable of finishing at the top of any meet they have scheduled this season. 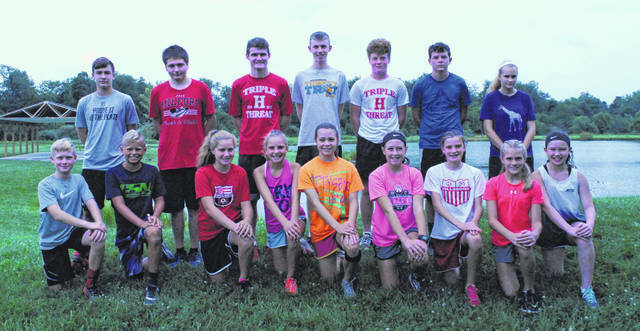 Expect the boys to compete for a FAC championship in 2018.
https://www.timesgazette.com/wp-content/uploads/sites/33/2018/08/web1_Hillsboro-Cross-Country.jpgMembers of the Hillsboro boys and girls varsity Cross Country team pose for a group photo at Harmony Lake in Hillsboro.